The NS-10MX drivers are both magnetically shielded. This cancels noise from/ to other nearby electrical equipment, and makes them the most pristine of the NS10's, but it adds 1kg in weight to each speaker. The specs are similar to the 1987 models (NS-10M PRO, STUDIO, MC), but the parts are six years younger than the 1987 models, and 15 years younger than the original NS-10M's. This also helps make the it a highly sought after monitor. The NS-10MX stands vertical and has the option of a removable front cover, thus giving it a similar appearance to the original 1978 NS-10M and the 1987 NS-10M PRO. It is visually distinguishable from them though, because it has no tweeter grill cover and so the tweeter sits flush with the sealed box. 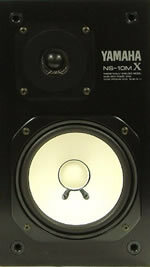 The NS-10MX is considered by engineers in Japan to be the pinnacle of the Yamaha NS10 series. However, it’s expensive and difficult to find outside of Japan, so it's not as well known as the earlier models. 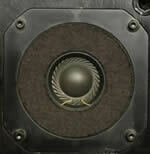 The NS-10MX stands vertical & has no grill over the tweeter.